In the embroidery industry, price is directly affected by the number of stitches in a given design. 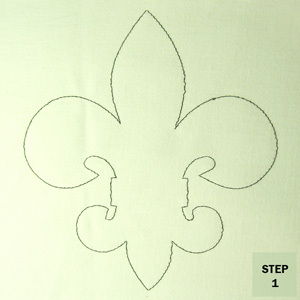 By using a unique applique process, the stitches can be drastically decreased by replacing stitches with fabric. Not only will this save costs & production time, it will also allow infinite variations of each design created. At Greenway, we have a process that combines design, digitizing, & fabric cutting with a quick turn around & impeccable quality. We have sourced thousands of fabrics, so each client can create their desired look. We invite you to see how Greenway can set you apart from your competitors. These fabrics are used for distressed techniques, for fraying & for lighter weight garments. 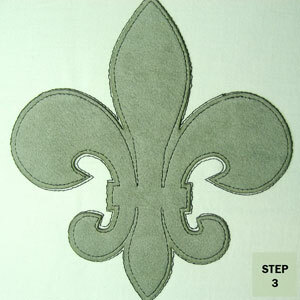 Felts are a great fabric for a variety of uses on large & small appliqué’s & have a very soft feel. 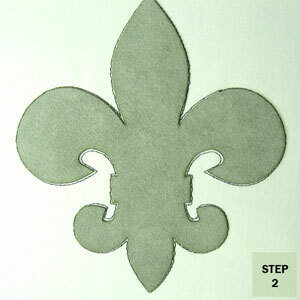 Suede’s & leathers are used on high end garments appliqué’s, they show quality & texture. Satin is a light weight fabric which works great on women’s apparel. Animal prints are often used for a wide range of appliqué, from the Rock N Roll industry to Zoo gift items. Jersey knit is very popular because of versatility & ability to be dyed. This fabric works great on light & heavy weight garments, with a very soft feel. This is a very durable fabric that is available in more than 80 colors. 3. Garment or textile for sewing the applique(s) on too. 4. The cut applique piece(s). Once all is in place, you can begin the process. The first step involved with this process is to sew the guide stitch, also known as the placement stitch for your applique. This will be the first sequence in your digital file for your design. Once complete, it is similar to what is seen here, although most all cases, the guide stitch will be tonal to your sewing surface. This means a white shirt will usually receive a white guide stitch; the color is contrasting here for the visual reference. After the placement stitch sequence is sewn complete, the machine will stop, and you may place your applique piece. At this point, it may be necessary to apply a light coating of spray adhesive to the back of the applique piece. This will aid in temporarily holding the applique in place until the stitch holds it permanently. The next sequence is the tack down stitch. Once your applique has been placed, the sewing machine will then hold the piece in its place with additional stitching. This step is usually a quick run over the edge of the cut piece. Your applique piece will now be sewn complete. The final sequence has the applique secured in place with the final stitching. 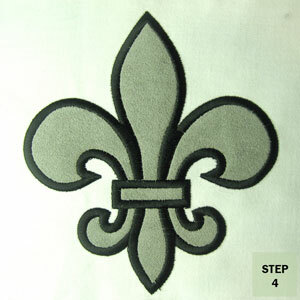 It may also be covered, given a border, or the additional detail to create your own unique applique design.